Alta’s Ethernet Avionics converters are the first and most unique Ethernet appliances in the industry. A real-time UDP server engine (no IP software stack like most other products on the market) provides direct data buffer and transmission control of MIL-STD-1553 and ARINC-429 interfaces. 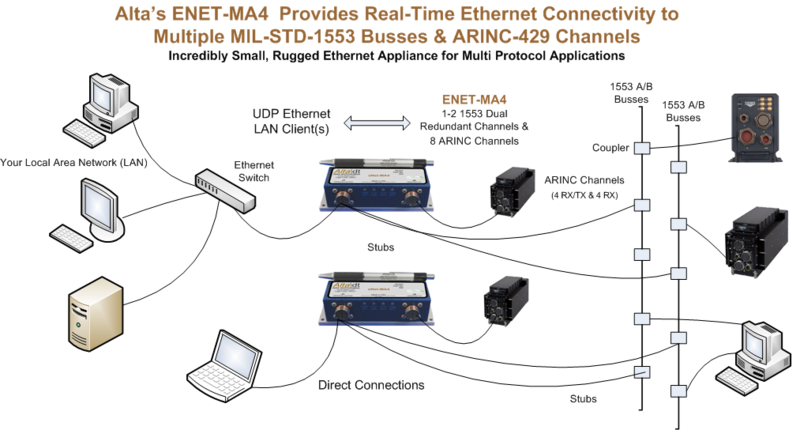 In addition, the ENET products can provide automatic 1553 BM or ARINC Receive bridging without any host interaction. Small, rugged, real-time devices that are ideal for test, simulation or rugged embedded applications. The ENETX-MA4 product is fully rugged, tested and ready to deploy. Tested to MIL-STD-704F/810G/461F and DO160 Sec 22! Small, light-weight, low-power – and the only FPGA real-time UDP engine on the market (no Processor, no IP Stack, no OS Overhead – no Viruses! ).